Zaleski Snow Guards has been around since the 1950s. Their snow guard design is based off of distributing snow guards on the roof instead of a row of snow guards or snow rail at the roof eave. Instead, the purpose Zaleski snow guards is to hold the snow on the roof where it falls, then as it warms up the the snow will melt faster. Zaleski Snow Guards are attached throughout the U.S. and Canada on all types of roofs. Install Zaleski Snow Guards on rubber, glass, tile, PVC, wood, asphalt, slate and metal roofs using and adhesive sealant, neutral cure, or by screwing the snow guards down. They have many types of snow guards. One of their most popular models is Model No. 15. 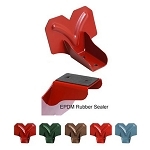 It is a small plastic snow guard that can be purchased clear or colored to match the roof surface (53 colors available click here to be guided to the color chart). Model No. 15 and Model No. 11-B are most commonly installed on metal, rubber, glass and PVC roofs. Other snow guards include Model No. 4, 6, 8, 12 & 13 for slate, asphalt, wood shingle and tile roofs. Lastly, Model No. 7,9 & 14 are installed on copper and other types of roofs. Please call Roof Things LLC for help with snow guard spacing. Note to Designer and Specifier: This specification is provided for your use by Zaleski Snow Guards for Roofs in CSI Masterformat. Edit to your project requirements. For more information, samples and spacing instructions, visit www.snowguards.com, or call 860-225-1614, or email info@snowguards.com. A. This Section specifies snow guards for installation on sloped roofing. Section 07 31 53 - Plastic Shakes. A. Product Data: Submit manufacturer's product data and installation instructions. B. Samples: Submit one full-size snow guard in color and material selected for approval. A. Manufacturer Qualifications: Provide snow guards manufactured by a company with at least 20 years experience in manufacturing snow guards. A. Deliver materials and products in unopened factory labeled packages. 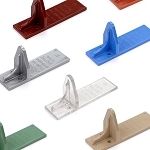 Store and handle in strict compliance with manufacturer's instructions and recommendations. Protect from damage. A. Acceptable Manufacturer: Zaleski Snow Guards for Roofs, Inc., PO Box 700, New Britain, CT 06050, Tel. 860-225-1614, Fax. 860-225-1060, www.snowguards.com. Note to Designer and Specifier: Select model number required and delete others. Model numbers listed are those most commonly used. Consult manufacturer for custom applications. The types of roofs suitable for use with each model number are listed with each type. Where more than one method for attachment is listed with a model number, delete the types not required. A. Copper Snow Guards: Zaleski Model No. 4, manufactured using 0.020 thick cold rolled copper, formed to double thickness. Slate Roofing: Hook unit over head edge of slate without nailing. Tile Roofing: Hook unit over head edge of tile without nailing. Asphalt Roofing: Fasten with nails. Wood Shingles: Fasten with nails. B. Copper Snow Guards: Zaleski Model No. 7, manufactured using 0.020 thick cold rolled copper, formed to double thickness. Copper Roofing: Attach with solder. Copper Roofing: Attach with sealant adhesive. C.	Lead-Coated Copper Snow Guards: Zaleski Model No. 7 L.C., manufactured using 0.020 thick cold rolled copper coated with lead, formed to double thickness. Lead-Coated Copper Roofing: Attach with solder. Lead-Coated Copper Roofing: Attach with sealant adhesive. D.	Stainless Steel Snow Guards: Zaleski Model No. 8, manufactured using 0.020 inch thick stainless steel, formed to double thickness. E.	Stainless Steel Snow Guards: Zaleski Model No. 9, manufactured using 0.020 inch thick stainless steel, formed to double thickness. Metal Roofing (Stainless Steel Only): Attach with solder. Metal Roofing (Except Copper): Attach with sealant adhesive. F.	Terne Coated Stainless Steel Snow Guards: Zaleski Model No. 9 T.C., manufactured using 0.020 inch thick stainless steel coated with lead and tin coating, formed to double thickness. Terne Coated Stainless Steel Roofing: Attach with solder. Terne Coated Stainless Steel Roofing: Attach with sealant adhesive. G.	Aluminum Snow Guards: Zaleski Model No. 6, manufactured using 0.020 inch thick aluminum 5052-H32, formed to double thickness. H.	Aluminum Snow Guards: Zaleski Model No. 11-A, manufactured using #319 aluminum for casting, tensile strength 17,000 pounds per square inch. Metal Roofing (Except Copper), Rubber or PVC Roofing: Attach with sealant adhesive. Metal Roofing (Except Copper), Rubber or PVC Roofing: Attach with screws. Color: Custom color as selected by Architect. I. Bronze Snow Guards: Zaleski Model No. 11-B, manufactured using bronze for casting, tensile strength 17,000 pounds per square inch. Copper Roofing: Attach with screws. J.	Lead-Coated Copper Snow Guards: Zaleski Model No. 12, manufactured using 0.020 thick cold rolled copper coated with lead, formed to double thickness. K.	Freedom Gray Snow Guards: Zaleski Model No. 13, manufactured using Freedom Gray, formed to double thickness. L.	Freedom Gray Snow Guards: Zaleski Model No. 14, manufactured using Freedom Gray, formed to double thickness. M.	Polycarbonate Plastic Snow Guards: Zaleski Model No. 15, manufactured using polycarbonate plastic, treated with ultraviolet stabilizer. Metal Roofing, Rubber or PVC Roofing: Attach with sealant adhesive. Metal Roofing, Rubber or PVC Roofing: Attach with screws. N.	Installation Tool at Existing Slate Roofs: Zaleski Model No. 24 installation tool, suitable for use with Zaleski Models 4, 6, 8, 12, and 13 snow-guards. A. Prior to start of installation, inspect existing conditions to ensure surfaces are suitable for installation of snow-guards. B. For snow guards installed with sealant, verify forecasted temperature will be above 20 degrees F for 48 hours after installation. A. Snow Guard Installation: Comply with manufacturer's installation instructions. Use manufacturer's recommended installation materials and installation tools. Attach snow guards securely. Clean adjacent surfaces after installation.